The optional MySQL toolbar includes MySQL specific functionality and links to external MySQL tools such as MySQL Workbench and MySQL Utilities. Additional actions are available from the context menu for each data connection. From the main menu, click Tools and then Customize. In the Toolbars tab, select MySQL to highlight it. The check box should have a check mark to indicate that the toolbar is visible. Select a dock location from Modify Selection. For example, the following figure shows the MySQL toolbar in the Dock location: Left position. Other dock locations are Top, Right, and Bottom. The MySQL script window supports the IntelliSense feature for easing MySQL script creation inside Visual Studio. 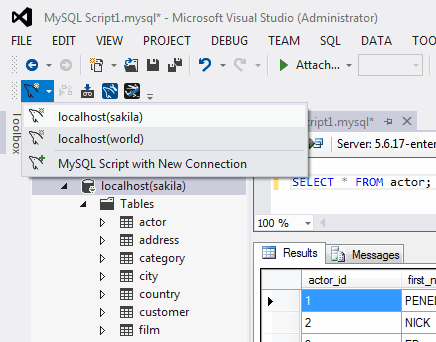 Debug MySQL Routine: Starts a debugging session on a selected MySQL stored routine inside Visual Studio. MySQL Data Export Tool: Opens a new tabbed-window of the Data Export tool. MySQL Workbench SQL Editor: Opens a new Workbench with an SQL editor window using the current MySQL connection, if MySQL Workbench has been installed. MySQL Utilities Console: Opens a new console window for the MySQL Utilities tool, if it is installed.